Insects are an important element in gardening. They can be both your friend and your enemy. Because of the vital role they play in pollination it is important to distinguish between the two and to learn beneficial ways of managing insects in the garden to maintain a healthy ecosystem. Presented by Bryce Lane, two-time Emmy Award winning television personality, retired Horticulture teacher at NCSU, and an accomplished garden speaker. $10.00 fee per class or Annual Membership fee. Feb. 20 – Getting Dirty With the Durham County Master Gardeners Radio Show – 2:00 pm on WCOM 103.5. You can add winter interest to your garden with North Carolina native deciduous hollies. Harold Johnson will introduce us to Ilex verticillata and Ilex decidua. 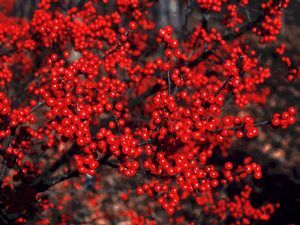 These hollies provide brilliant red berries for you, and the birds, to enjoy throughout the winter months.